WOOMC’s XCHANGE Student Ministries endeavours to empower today’s youth to lead lives that are Christ centered. Our goal is to produce divine transformation in teens so they may be equipped to reach their peers with the gospel of Christ. We strongly promote our church’s vision to “Love God – Embrace Others – Touch Destiny. We also offer our young people several opportunities to serve, participate, and get involved in group life, and develop themselves as leaders. XCHANGE is a place where teens can come as they are, meet and bond with new friends, participate in exciting activities, and find leaders who truly care about them. Most importantly, they will develop a strong relationship with God. Our teen services feature heartfelt worship and solid Biblical teaching that will grow and challenge teens and ultimately develop them into the leaders God created them to be. 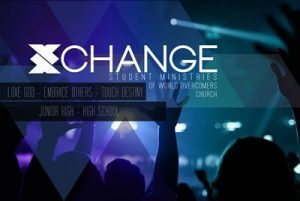 XCHANGE meets on Sundays in the student sanctuary at the WORD DOME @ 11am. We invite all teens and their parents to check us out. We hope to see you there! Text XCHANGE to 71441 for student ministry updates.